Difference between revisions of "Daughters of Bilitis"
The Daughters of Bilitis (DOB) was the first lesbian-centered organization founded in the United States established in San Francisco in 1955. Founded by Del Martin and Phyllis Lyon, who were seeking a safe space to socialize with other lesbians, the DOB soon became a forum for the promotion of lesbian rights in the homophile movement. The organization published the popular magazine The Ladder from 1956 through 1972. In the mid-1960s, changes in political and social culture surrounding feminism and homosexuality caused rifts in the DOB. The Ladder separated from the organization in 1970, and the DOB lost traction nationally throughout the 1970s. In 1978, the DOB’s final chapter closed. Phyllis Lyon (left) and Del Martin (right), mid-1950s. When Martin and Lyon were invited by a friend of a friend to join a small, secret lesbian social club, they jumped at the opportunity. The first social meeting of eight lesbians took place in 1955, and out of this meeting the Daughters of Bilitis was born. 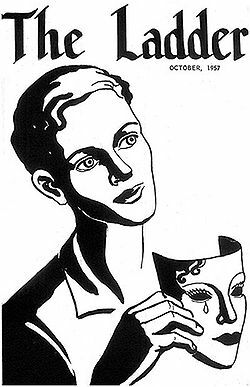 The group named itself the Daughters of Bilitis after the poetry collection Songs of Bilitis by Pierre Louys, a work that depicts a fictional lesbian woman who lived alongside Sappho in Ancient Greece. The homophile movement began with the inception of the Mattachine Society, a group founded in Los Angeles in 1951 by homosexual men intending to spread awareness and educate the public on matters of homosexuality. The DOB mirrored the Mattachine Society and its homophile principles in many ways: both groups were founded with social intent, turning later towards the political; both groups urged their constituents to participate in psychological studies and to work to actively educate the masses against the stereotype of homosexuals as “sick”; both groups worked to combat the fear that permeated the queer community during the 1950s due to widespread bigotry, frequent police raids on gay and lesbian bars, etc. ; and both groups emphasized the concept of “fitting in” to the larger heteronormative community rather than embracing difference in sexuality and gender. However, the DOB focused their efforts primarily on the causes of women and lesbians, and at times members resented their representation as “auxiliary” to the Mattachine Society. By 1960, the DOB had spread throughout the United States, and the organization’s first national convention, publicized by the DOB as “Ten Days in August,” took place at the Wickham Hotel in San Francisco, and was deemed a success by members of the organization. As the DOB began to gain traction, they decided to begin publishing a small newsletter for members of the organization. The first issue of The Ladder was published in October of 1956. The first issue had the express intent of attracting new members, and included a copy of the DOB’s statement of purpose. Subsequent issues of The Ladder contained various articles, interviews, group event calendars advertising group bowling outings and “Gab ‘N Java Sessions,”and even pieces of short fiction and poetry written by members of the DOB and other contributors. I’m glad as heck you exist… Women, like other oppressed groups of one kind of another, have particularly had to pay a price for the intellectual impoverishment that the second class status imposed on us for centuries created and sustained. Thus, I feel that The Ladder is a fine, elementary step in a rewarding direction. L.H.N. was Lorraine Hansberry Nemiroff, whose play A Raisin in the Sun made its debut on Broadway two years after her message was published in “Readers Respond.” Hundreds of other women across the United States echoed Nemiroff’s eager readership, until The Ladder ceased publication in 1972. By the mid-1960s, the political culture around homosexuality and protest was changing; the homophile movement and its call for assimilation gave way to the activism and celebration of identity of the pride movement. A new generation of lesbians was taking power in the Daughters of Bilitis, with Shirley Willer taking over as the first national president elected from outside of San Francisco in 1966. The rise of the feminist movement throughout the United States also caused tension among group members, who began to split ideologically between emphasizing gay rights and women’s rights. When Barbara Gittings took over as editor of The Ladder, some members of the DOB criticized Gittings for her active incorporation of gay male contributors to The Ladder, feeling she was beginning to stray from The Ladder’s intents as a magazine with specific lesbian interest. Gittings was controversially removed from her position as editor in August 1966, and, along with other members of the DOB, began working with more general gay rights groups; some former DOB members helped to found the Homophile Action League in 1968. Around this time, Martin and Lyon began working closely with feminist activist group National Organization for Woman (NOW), turning their attention away from the DOB. The DOB leadership attempted another national convention in Denver in 1968, with a turnout of less than 30. Due to controversies in leadership and direction, The Ladder published its last issue in 1972. Though it had officially split from the DOB in 1970 after Laporte’s theft, the demise of The Ladder signified the end of the DOB for many women in the group. Some chapters continued meeting occasionally, but the close of the original San Francisco chapter in 1978 marked the DOB’s formal demise. Martin and Lyon remained active figures in both the women’s rights and gay rights movements, and made the news for an historic moment in 2004 as the first homosexual couple to be offered a marriage certificate in San Francisco. Boyd, Nan Alamilla. Wide-Open Town: A History of Queer San Francisco to 1965. Berkeley: U of California, 2003. Print. "Del Martin & Phyllis Lyon." LGBT History Month. Equality Forum, n.d. Web. 04 June 2015. Katz, Jonathan, ed. [website.maxwell.syr.edu/wmstory/GittingsBilitis.pdf Gay American History] (pdf). New York: Avon, 1976. Maxwell School of Citizenship and Public Affairs. Syracuse University. Web. 5 June 2015. Parr, Leslie, ed. The Ladder. Vol. 1-2. New York: Arno, 1975. Print. The Arno Ser. on Homosexuality. Ripberger, Ann. "The Homophiles & The Social Scientists." Lesbian History. University of Michigan, n.d. Web. 7 June 2015.